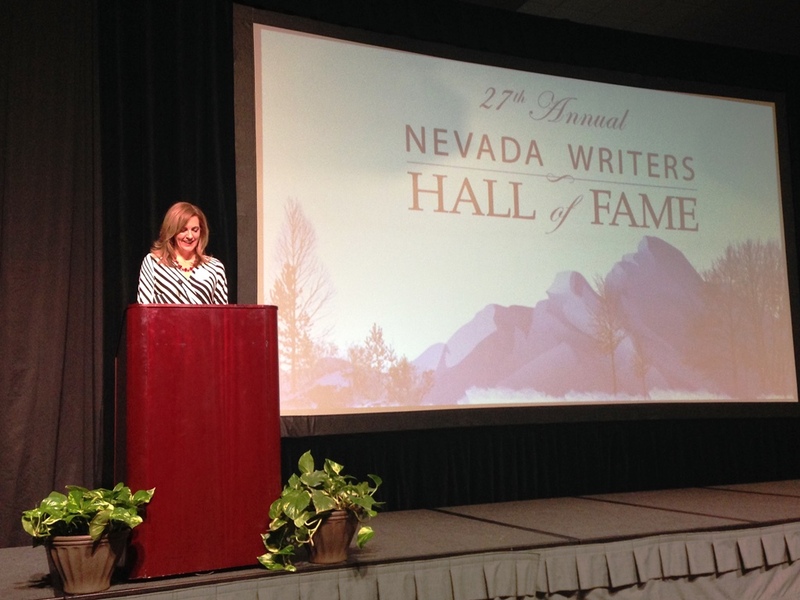 Earlier this week I was deeply honored to receive the Silver Pen Award on the same night that two wonderful writers, Ron James and Shaun Griffin, were inducted into the Nevada Writers Hall of Fame. Several people have asked for copies of my remarks, and so I include them here, as doing so provides me yet another opportunity to acknowledge those who have influenced my writing career and to thank many others who have encouraged and inspired my writing so far. I am filled with gratitude. Thanks to all of you for being here. Thanks to the selection committee. Thank you so much to the Friends of the University Libraries for this honor and for all the work that you do. Libraries need friends. Libraries have been very good to me. I wanted to become a writer because of a lot of people I met in libraries. Laura Ingalls Wilder. Louisa May Alcott. Dr. Seuss. Mark Twain. Henry David Thoreau. Edith Wharton. Nathaniel Hawthorne. William Shakespeare. Virginia Woolf. Gabriel Garcia Marquez. Walt Whitman. I could go on. I wanted to become a writer because I wanted to move people the way I had been moved by these authors’ words and to transport people the way they had transported me. But I wanted to become a writer of history in particular because of one person: Wallace Stegner. Wallace Stegner is the reason I went to graduate school and the reason I study and write about the American West. I am not a native Nevadan, but I am a westerner. And like a lot of westerners, I am from a lot of different places. My parents, who are here tonight, are from Alaska and Washington state. We lived in southern California and Utah. We spent many years in New York but ended up back in the West. I had been aware of Wallace Stegner’s work for a long time, but I didn’t start to read his work in earnest until his death in 1993. And once I started reading, I couldn’t stop. Not only did his writing transport me, but he felt like a kindred spirit. Like me, he was a child of the American West. Like me, he had spent a lot of time in Salt Lake City and Palo Alto. Like me, he had moved around and had no single place to call home. 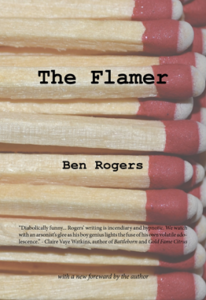 He understood the tension between the exhilaration of rootlessness and the hunger for stability and a sense of place. And he pointed out that that wasn’t just the plight of a few individuals—that was part of the West’s intrinsic nature. And it had consequences. I wanted to understand how that could happen and was happening, how a community could lose its memory, and its character, especially in the West, where that character was so strong, and so tied to this incomparable landscape and these immense open spaces. That’s what first brought me to Reno. I wanted to understand how this most unique of western places was struggling with its identity, and in its quest to find secure economic footing, was in danger of losing its identity and its character. The city had undergone so many changes, some so suddenly, that the past was in danger of being completely erased and forgotten. Then as I stayed longer, as I learned more, as I became part of this community, I wanted to help do something about that. I wanted to learn not just how a community could lose its memory, but how it could get it back. I wanted to help reverse that process, to strengthen a sense of place and make the city more meaningful to people through understanding its past. And in my writing and my public history work, that is what I am trying to do, to help strengthen our understanding of the places where we live. I want to reach people wherever they are—in a library, in their home, on the computer, in a park, waiting for the bus. I want to be a part of the effort to preserve individual memories, to strengthen our collective memory and create an ethic of care about this place and about each other. And that is what Wallace Stegner stood for, too. He was not just a writer and a scholar; he was an activist. He didn’t just want to explain the West. He wanted to inspire people to act, to save the places they cared about. I have now lived here for eleven years, which is the longest I’ve lived anywhere. I know this place better than I know any place. Reno has become my home and my inspiration. 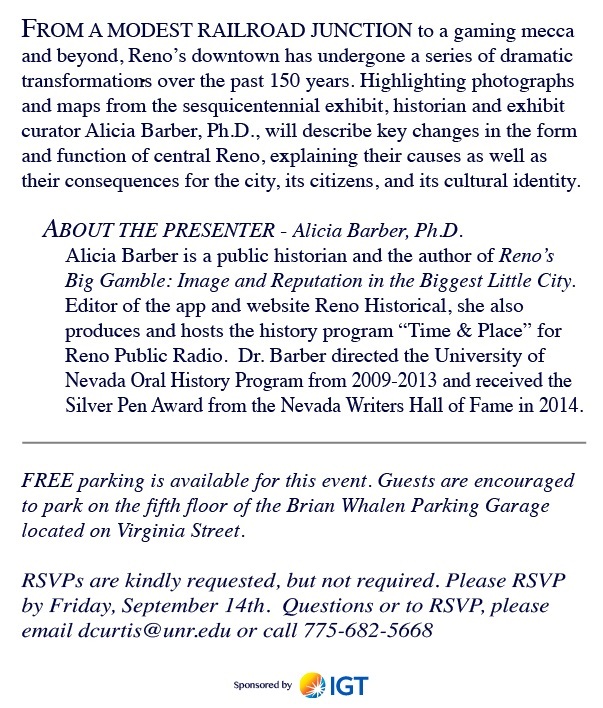 I am immensely grateful to Phil Boardman for bringing me to Nevada as a postdoc in Core Humanities in 2003. 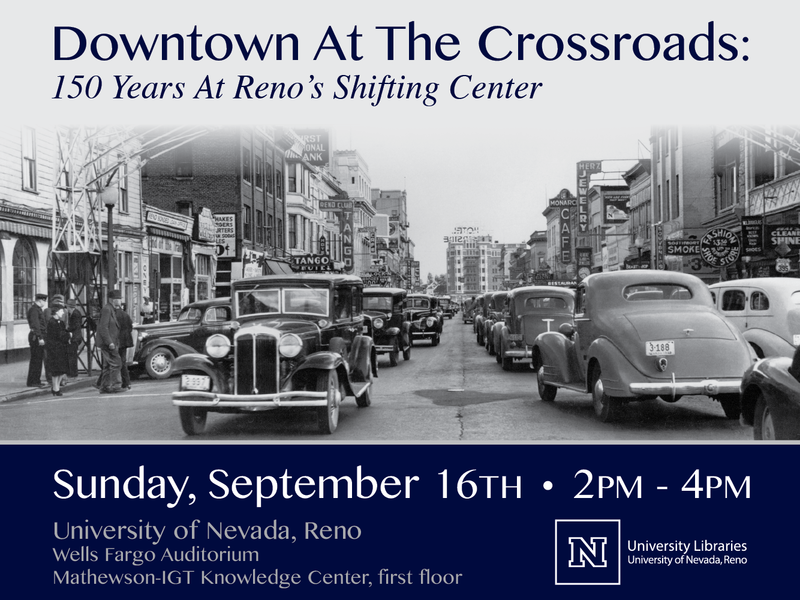 I’m grateful to Tom King for recommending me to direct the University of Nevada Oral History Program, a job that I absolutely treasured from start to finish. And I want to thank all of my friends and colleagues—so many of you are in this room—who have encouraged and inspired me. Thanks to my parents who have read everything I’ve written since I was five. And to my husband, Mark, another westerner, who I met ten years ago last week at the Nevada Museum of Art. No one could be more supportive. There was a time not so long ago when I wasn’t sure there was a place for me here or if this was what I was supposed to be doing. But the past year has shown me that there is and I am. This award means the world to me, and I accept it as confirmation that I’m on the right track, and encouragement to stay on it. I am so proud to be the warm-up act for the two gentlemen we are truly here to honor tonight.